It seems like a lazy comparison to say that Alunah sounds kind of like a female fronted Black Sabbath, but dammit the shoe fits, so that’s what I’m going with. This foursome from Birmingham, England dabbles in doom metal of the slow and low variety, with equal parts fuzzed out and groovy psychedelic rock thrown into the mix. Guitarist David Day, bassist Gaz Imber and drummer Jake Mason make enough noise to truly awaken the unholy spirits as the name of their album implies (Avernus is an Italian crater lake that was considered to be the entrance to the underworld in ancient Roman lore), but what really sets Alunah apart from their peers is the ethereal voice of singer Sophie Willett. The combination of her delicately powerful vocals with the sheer immensity of the band’s sound is best described as…well, let’s call it majestically heavy. Call of Avernus begins with a trudging bass line from Imber that is slowly built upon by a wall of feedback and riffage from Willett (she also plays rhythm guitar) and Day, until Mason unloads on his drum set and the band explodes into the up-tempo album opener “Living Fast in an Ancient Land”. Willett’s vocals then enter the fray for the first time and they’re like a vapor swirling all around you…it’s impossible to know which direction they’re coming from as they envelope you like a mist. Check out the song's bridge at around the four and a half minute mark for an example…beautiful! The title track follows with another trance inducing riff and flat out catchy drum beat. This one is an eerie ode to the place called Avernus as it finds Willett crooning “and the birds fall from the sky”, an obvious nod to the legend that any bird that dared fly near the crater would fall dead (in fact the English translation of Avernus is “without birds”). And I can’t tell if it’s the guitars or the vocals, but Alunah seems to be using some kind effect here that gives the song a weird sort of submersed quality as Willet appropriately sings the line “the water’s deep, I can feel it now”. Whatever it is, it works. And once you get to “Song of the Sun” the band has really hit their stride as they crank their Iommi worship to eleven with solid riffs, a nice little psychedelic guitar solo and more lyrics of the mystic variety. Speaking of psychedelic…“Magick Lantyrn” is a hazy, trippy sort of breather if you will…a mellow interlude that ultimately delivers the listener into the clutches of the heaviest groove on Call of Avernus…the epic “Eternal Sea”. This one starts off as a fairly standard doom number with Willett's ghostly vocals residing just under the surface of the music, but then it begins a metamorphosis of sorts, first into a scorching guitar solo, then slowing to an extended, almost proggy jam and finally changing pace into a pure sludge-fest that sees Alunah slowing things down…and down…and down until all that's left is a blanket of feedback. And just as you begin to wrap your head around that devolution in sound, the band ramps everything right back into a fast paced, punk beat as they jam out on "Dance of Dionysus", by far the catchiest song on the album. "Circle of Stone" almost feels like two different songs as it begins with subtle interplay between the guitar and bass and then sees the rest of the band pick up on the groove and transition into a smooth instrumental jam…well not really I guess, as Sophie interrupts briefly to add a line or two of prose. But the steady groove completely transitions at about the five minute mark and Alunah are off and running again. "Higher" is Alunah at their doomiest, as it sees them mining Electric Wizard territory in the down tuned, evil-tastic riff department…but again, its their vocals that separate them from the others, giving Call of Avernus a sound all its own. The album concludes with "Hermetic Order of the Golden Dawn" another heavy, chugging monster of a song that will leave your head bouncing to its solid groove. 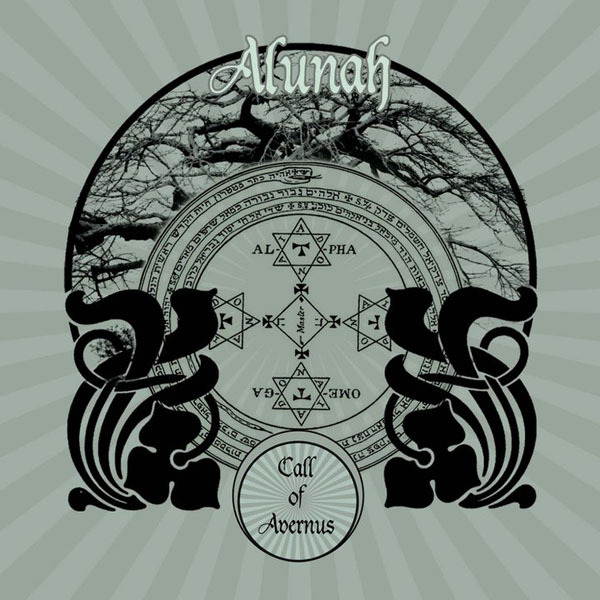 With Call of Avernus, Alunah has created an album that, in my opinion, moves them right alongside a lot of the doom bands from whom they so obviously draw their inspiration. The difference is that they actually manage to strip away the filler some bands tend to use as a crutch when recording a full length. Add to that a sincerely original vocal approach courtesy of Sophie Willett and you have something fresh and exciting in a genre that prides itself on minimalism. They're doom without being too gloomy…they're riff rock without becoming stale or monotonous…and they manage to explore different sounds and textures without being too experimental. Go ahead...give Alunah a listen…the Call of Avernus beckons.